This is a letter to the governor asking for more categorical funding for office hours. Last year, as a result much effort by many, including a letter campaign similar to this one, we were able to get a 70% increase to the State Part-time Office Hours Fund. This is still a drop in the bucket to what is needed, because the state only matches 10% of what local districts pay out for office hours. For this reason, the pay is low, and hours are limited, and that’s if a district actually has a paid office hours program. We need more money, and this is the letter for it. It’s similar to the letter put out as a part of Campus Equity Week last Fall, but it’s been “freshened up,” and is this time not directed to the Director of Finance, but to the governor himself. Copy the letter, paste it, make any changes you want, print it, sign it and send it, or better yet print it, make hundreds or thousands of copies, give them to everyone you know, collect them, and send them. By the way, print is better than email. In your most recent budget summary, you have made it clear that you take a concerted interest in the achievement of student success. One of the most significant components in the achievement of student success is a meaningful and productive student-teacher interaction and it is not limited to what happens in a classroom. These interactions often require students and teachers to meet outside the classroom to discuss student issues that at times may not be just curriculum but other educational matters that are necessary for providing direction and ultimately leading to student success. It has been found in repeated studies that this outside-the-classroom student interaction is often one of the most critical factors in helping the most at risk and challenged students to succeed. A teacher needs to be more than just a classroom facilitator for the student to succeed. 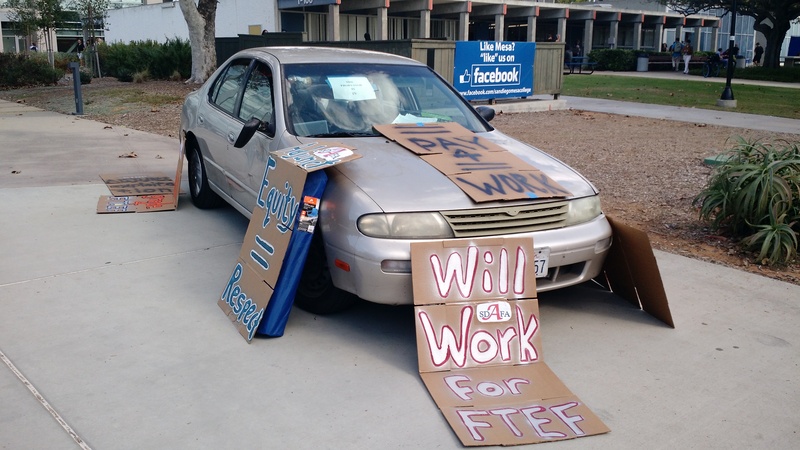 It then is highly ironic to know that at California Community Colleges approximately 70% of faculty are temporary, part-time, or adjunct instructors, who are largely paid only for their time in the classroom. In addition, because many are disproportionately paid at half the rate or less than their full-time counterparts, these adjunct instructors will often have to travel to other districts to teach, leaving them with limited time to fully interact with their students. Some of the obvious solutions to increasing this student-teacher interaction would be to hire more full-time instructors to be in compliance with the 75-25 full-time/adjunct ratio that is mandated by AB1725, or to simply provide the funds to pay adjuncts more equitably in relation to their full-time counterparts. A more immediate step that you and the legislature chose last year was to increase state part-time office hours by providing an additional five million dollars to the office hour fund. While this clearly was a step in the right direction, this fund only covers about 10% of the local part-time office hour funding. This lack of funding leaves many districts to choose to offer very limited office hours (for example, 2-3 hours of paid office hours for an entire semester for a 3-unit course at Southwestern College or a total of 8 hours for the entire semester at Pasadena City College regardless of the number of courses taught) or no paid office hours at all. As evidenced, the money in the state part-time office hours program is inadequate and needs to be increased. Please consider allocating an additional 25 million dollars for the state part-time office hours program. 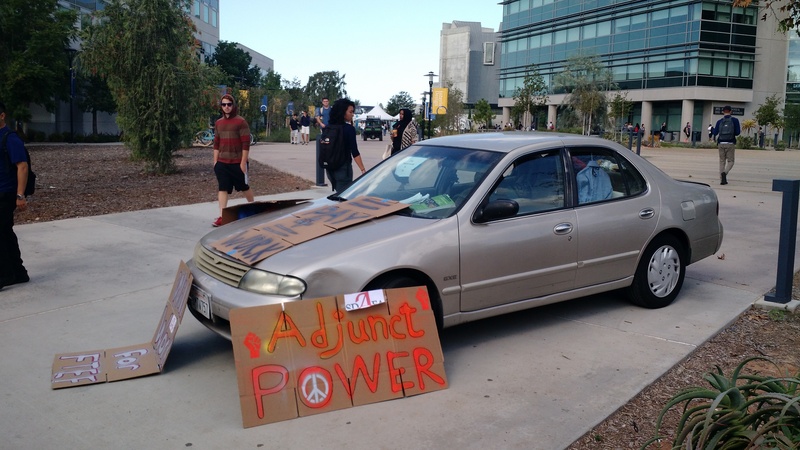 Empower California’s adjuncts to create the student-teacher interactions critical to student success. Last week I had the pleasure of seeing Thomas Piketty speak on economic inequality at UCSD. In his talk, Piketty hit on the central themes of his seminal work, Capital in the Twenty-First Century: how our current level of economic inequality is now back to where it was before the “great compression” of the mid-twentieth century when union density, progressive taxation, and educational policies helped produce the high point of the American middle class. He underlined how there is no economic benefit to our current level of excessive inequality and that it is the product not of any “natural” function of the free market economy, but rather several decades of wrong-headed ideology, destructive politics, and bad policy. During the question and answer session following his presentation, a well-heeled older gentleman prefaced his question about why the “lower 50 percent” don’t just vote out the bad policies with, “this audience, we’re all the top 10%,” which drew a few laughs from people, many of whom were likely debt-ridden students, teaching assistants, campus workers, and lecturers whose income doesn’t come close to landing them in that realm. That there may have been a ragtag group of professors and students from lowly City College in attendance was not even in the speaker’s imagination. I couldn’t help but think how UCSD is a perfect microcosm of the macroeconomic inequality that Piketty was talking about and that the class-blind commenter was a perfect manifestation of the very elite ideology that serves to enforce our deep level of inequality. But of course, it’s not just at UCSD where this is an issue but across the entire landscape of American higher education, where what used to be one of the most solid middle-class professions in the country is in the process of being hollowed out, bit by bit. Coincidentally, October 26th through the 29th happens to be Campus Equity Week, a twice-a-year action designed to bring attention to this very problem. Thus, I will leave the rest of my column to Dr. Ian Duckles, my adjunct colleague in the San Diego Community College District, to further illuminate this issue.